My guest writer today is American pianist and author Rhonda Rizzo. Rhonda’s previous guest post focused on her new novel, The Waco Variations. As she has enjoyed considerable success as a recording artist, I asked Rhonda to write about her experiences in the recording studio. One of the biggest goals most musicians have is to create a recording. For the professional, it’s a necessary rite of passage and it’s a worthy goal for talented amateurs as well. Thankfully, what was once reserved for record label artists is now open to anyone. But since the process of making a record is neither simple nor inexpensive, it’s important to learn as much as possible about it before you start. These brief tips are some important things I’ve learned through recording my own CDs. * Be clear about what you want to record and why. It’s much more complicated to create a professional recording than to preserve a few pieces for family and friends. Research saves time, money, and a lot of frustration. * Know your chosen repertoire very, very well. Perform it anywhere and everywhere for anyone who will listen. Record yourself playing, both to hear yourself clearly and to become comfortable being recorded. Make sure you can play the music flawlessly from beginning to end, in perfect time. Yes, recordings can be edited, but editing is tedious and expensive. You’ll thank yourself later if you do your work before you enter the studio. * Decide if you wish to record a “live” album or studio recording. Live albums have the advantage of being less expensive than studio recordings, but they’re inherently less perfect because you can’t do things a second time in a concert. * Research your local recording options. If using a studio, which has the best piano? If recording in a performance hall or church, is it soundproofed? Because the piano has a huge dynamic range, it’s important to find an engineer who has experience recording the instrument, which includes capturing the overtones and the effects of the room. * Create the cover art. Unless you’re a graphic artist with lots of experience making album covers, hire someone to create it for you. Know (before you start) if you want to make a physical CD, offer the music as digital downloads, or both. * Hire a tuner/technician to prep the piano for the recording. * Don’t try to record for more than 4 hours a day. Full-length albums will most likely require several 4-hour days to complete, even if you’re perfectly prepared. * Show up rested. Wear comfortable clothes and bring plenty of water and favourite snacks. * Take breaks as needed. Move around and stretch. * Be gentle with yourself; “red light panic” is real, people. * Wear headphones to hear how the piano sounds through the mics. * Record several “takes” of each piece so you have choices. * Editing. This is where the real work begins. Your first task is to pick the “take” you prefer. If the take contains mistakes, this is your chance to edit them out, usually by re-recording sections. Depending on the number of edits required, this can take hours. * Mixing. All the mics record different parts of the piano or the room. This phase mixes everything together. This is also where the engineer can “tweak” the sound by changing how “live” the room sounds, or emphasizing one part of the piano over another. * Mastering. This is the stage where the individual tracks are turned into an album. All the recording levels need to be even. The spacing between the tracks needs to be uniform. For more information on mixing and mastering, click here. * If creating physical CDs, be prepared to work through a professional distribution company. I recommend CDBaby. I also recommend using them for distribution of digital tracks as well. There’s a reason the phrase “art isn’t easy” is a cliché. Making a record is a big commitment of both time and finances, and experience has taught me that doing this sort of thing “on the cheap” usually leads to disappointing results. The more you can afford to pay professionals to record, edit, mix, master, press, and distribute your CD, the easier you’ll find the process. Do your research before you begin the project and commit to giving the process your best playing, time, and financial resources. Your reward? An album you can be proud of for years to come. Rhonda Rizzo is a performing and recording pianist, and author. 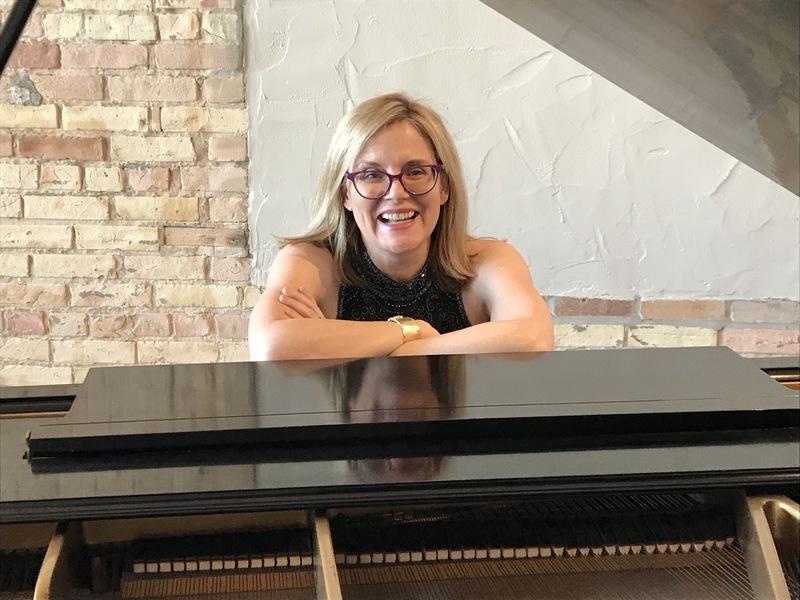 She has released four CDs, Made in America, Oregon Impressions: the Piano Music of Dave Deason, 2 to Tango: Music for Piano Duet, and A Spin on It, numerous articles, and a novel, The Waco Variations. She’s devoted to playing (and writing about) the music of living composers on her blog, www.nodeadguys.com. The Waco Variations, a Novel is available at www.Amazon.com.